When and how did Art in Embassies begin? The Museum of Modern Art (MoMA) initiated exhibitions of contemporary art for U.S. embassy residences in 1953. 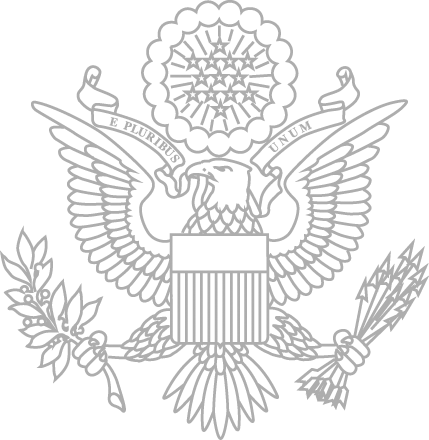 Ten years later President John F. Kennedy established ART in Embassies as an office within the U.S. Department of State. How does AIE fulfill the mission of the U.S. Department of State? AIE advances cultural diplomacy through artist exchanges and the presentation of works by outstanding American and international artists to audiences around the world. Who selects the works of art? A staff of curators guides the selection process. How many artists are featured in Art in Embassies exhibitions each year? Over 2,000 artists participate every year. AIE engages hundreds of new partners each year for its exhibitions and collections. What is an AIE exhibition? AIE exhibitions are temporary and include contemporary and historic works of art on loan from artists, museums, dealers, corporate collections, private collectors, and other partners. The length of an exhibition corresponds to the Ambassador’s term, approximately three years. The Department of State also houses a small collection of works that are regularly incorporated into temporary exhibitions. What is a permanent collection? AIE permanent collections include art by both American and host country artists and are permanent installed in U.S. embassies, consulates, and annexes built in recent years. Each collection serves as a bridge, celebrating the ties between American and local visual cultures. Collections existing work and site-specific,commissions. Art in Embassies (AIE) oversees all aspects of each project from negotiations and acquisitions through installation. AIE registrars are experts in the safe handling, packing, and shipment of fine art. They manage all exhibition logistics. Liaising worldwide with artists, collectors, museums, foundations, dealers, and professional fine art service companies, the registrars ensure that each work of art is safeguarded and insured from door to door. AIE hires specialized fine art handlers to assemble, pack, crate, and safely ship works of art to and from our diplomatic facilities. Art in Embassies fully insures each shipment of art (door-to-door) and on location. AIE complies with all shipping requirements from our lending partners. The terms of many loans, particularly those from museums, often include strict requirements pertaining to packing and crating, shipping, courier accompaniment, handling, placement, and light and humidity levels. Art in Embassies registrars ensure that lender requirements are upheld. Registrars also make certain each work of art is fully documented and ready for shipment overseas. A typical exhibition requires a minimum of one month for consolidation, sometimes more if works are being collected from multiple locations throughout the United States.